The roots of Amish Mission furniture can be traced back to the late 19th century, but to this day remains one of the most popular furniture styles on the market. 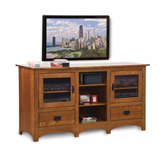 Our Mission style category allows you to conveniently shop all of our handmade wood furniture in one place. While browsing this category, you will notice the many variations of Amish Mission furniture, Mission living room furniture, and more. Some are more thoroughly Mission while others may have more subtitle Mission accents. Mission furniture is a broad and general style that consists of dozens of mission style variations, such as the Royal Mission series, Shaker Mission series, and Craftsman Mission series, for example. Different builders may also create their own line of Mission furniture that’s showcases a new twist on the Mission design philosophy. You will see Mission furniture styles in many different types of handmade wood furniture, the most popular being dining room tables and chairs. Also find Mission bedroom furniture, Mission living room furniture, cabinets, shelves mirrors, TV stands, shelves, or waste baskets. If it can be built into furniture, it can be Mission. The Mission design philosophy does a brilliant job at emphasizing the natural beauty of wood grains by emphasizing very simple, straight vertical and horizontal lines that usually run ninety degrees to one another. Mission furniture is most popularly done in oak, but several other wood types are also used such as cherry, maple, or hickory. The timelessness of mission style handmade wood furniture could be attributed to its universal simplicity that seems simultaneously straddle the feel of contemporary and traditional styles. In 1894 A.J. Forbes made one of the first Mission chairs for San Francisco’s Swedenborgian Church before the term was made popular by furniture manufacturer and retailer, Joseph P. McHugh, from New York. McHugh copied the chairs made by Forbes, and 1898 developed a stylistically similar line to sell to consumers. The term mission came from the Spanish missions that aimed to spread Christianity throughout colonial California, which then somehow became associated with the style recognized as Mission today. Amish Mission furniture became widely popular after the Pan American Exposition in Buffalo, NY in 1901. It could be argued Mission style wood furniture can be further traced back to the Arts and Crafts Movement that originated in England in the 1880’s.